I had fun lying on the ground and taking pictures of the mayapples and bloodroot today. Some of the bloodroot flowers are already open, but I didn’t think to take clear pictures of them. Too fascinated by the way they come up with the leaves wrapped in tight little bundles but fully formed along with the flower buds in the center. If you squint, though, you might see the tiny white, crocusy-tulipy shaped flowers in the background (upper left quadrant). Those are bloodroot flowers. 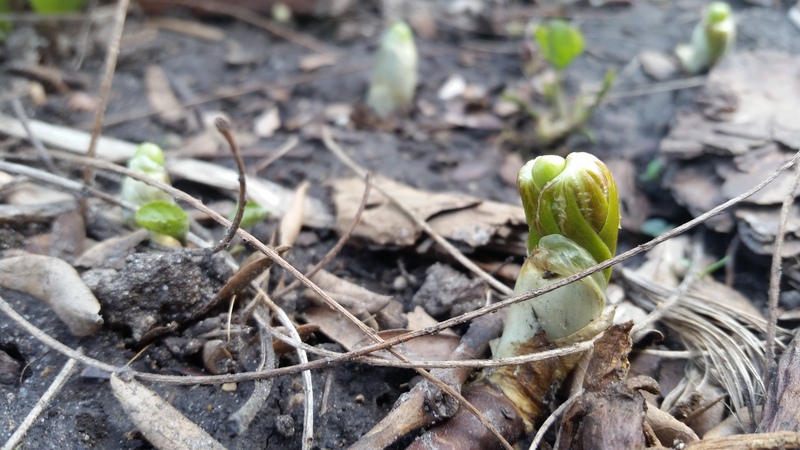 Why are they called bloodroot? It’s not the color of the flower, even if they are reddish purple at the base. If you cut into the root, you’ll find that it’s bright red and exudes a liquid that really does look like blood. Just the kind of thing Professor Sprout would have loved to show the kids at Hogwarts.